The fantail is one of the most common and widely distributed native birds in New Zealand. You can find them all over our forest – when there are small insects flying in swarms around the treetops you can spot the fantails feeding on them while standing on our platforms. Try and spot them with their long tails opening up into a fan. 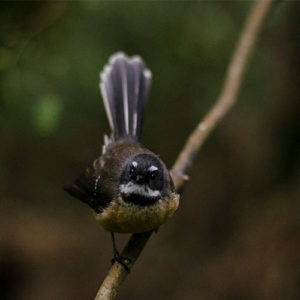 The lifespan of a fantail is relatively short in New Zealand as the oldest bird recorded in NZ was 3 years old but has lived up to 10 years in Australia. Both the adult fantails incubate eggs from about 14 days and both adults will feed the young, but as soon as the female starts building the next nest the male will take over feeding – the young are fed about every 10 minutes which is about 100 times per day. Fantails are a good indicator species. They tell us that where there are a good number of fantails, the forest is in good health. We find heaps in our forest which is awesome! The Maori believed that the fantail was responsible for the presence of death in the world. Maui, thought he could get rid of death by successfully passing through the goddess of death, Hine-nui-te-po. He tried to enter the goddess’s sleeping body through the pathway of birth. The fantail, warned by Maui to be quiet, began laughing and woke Hine-nuite- po, she was so angry that she promptly killed Maui.